Stomach, Forestomach - Inflammation, Suppurative in a male F344/N rat from a chronic study. This suppurative inflammation is associated with an ulcer. Stomach, Forestomach - Inflammation, Chronic in a female B6C3F1 mouse from a chronic study. 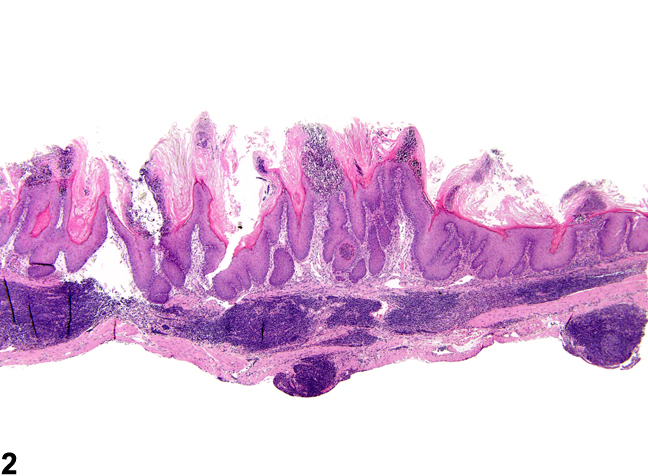 Numerous lymphocytes are present in the submucosa and serosa, often forming nodules or follicles similar to gut-associated lymphoid tissue. 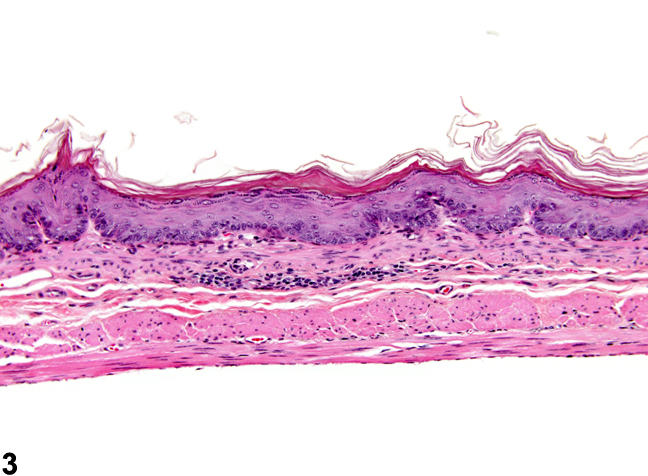 The overlying epithelium is hyperplastic and contains suppurative inflammation. Stomach, Forestomach - Inflammation, Chronic in a female B6C3F1 mouse from a chronic study. Minimal chronic inflammation is present in the submucosa. Stomach, Forestomach - Inflammation, Chronic active in a female B6C3F1 mouse from a chronic study. 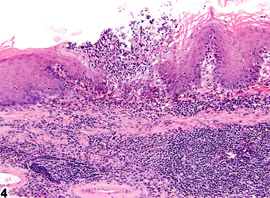 Numerous lymphocytes, macrophages, and neutrophils are present within the submucosa; the overlying squamous epithelium of the stomach is hyperplastic and ulcerated and contains suppurative inflammation. Stomach, Forestomach - Inflammation, Chronic active in a male F344/N rat from a chronic study. 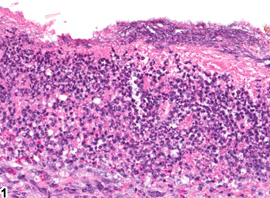 Numerous lymphocytes, plasma cells, and neutrophils are present within the submucosa; the overlying squamous epithelium of the stomach is hyperplastic. Inflammation can occur in the forestomach as elsewhere in the gastrointestinal tract. 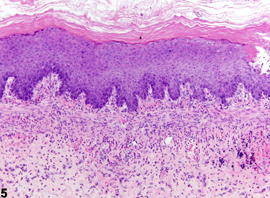 Lesions can be spontaneous (idiopathic), related to gavage procedure, or due to direct/indirect chemical toxicity. Inflammation in the forestomach most often occurs in association with epithelial hyperplasia, ulcer, or erosion. Inflammation can be diagnosed as acute, suppurative, chronic, chronic active, or granulomatous. In acute inflammation, the predominant infiltrating cell is the neutrophil, though fewer macrophages and lymphocytes may also be present. There may also be evidence of edema or hyperemia. The neutrophil is also the predominant infiltrating cell type in suppurative inflammation ( Figure 1 ), but the neutrophils are aggregated, and many of them are degenerate (suppurative exudate). The exudate may also contain cell debris, both from the resident cell populations and from infiltrating leukocytes; proteinaceous fluid containing fibrin; fewer macrophages; occasional lymphocytes or plasma cells; and, possibly, an infectious agent. 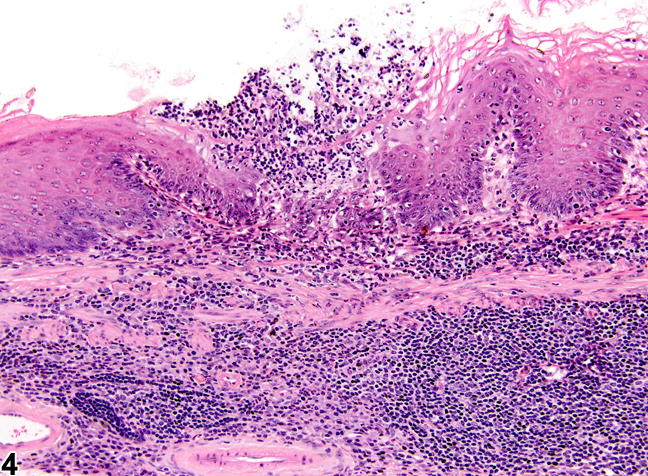 Grossly, these lesions would be characterized by the presence of pus. 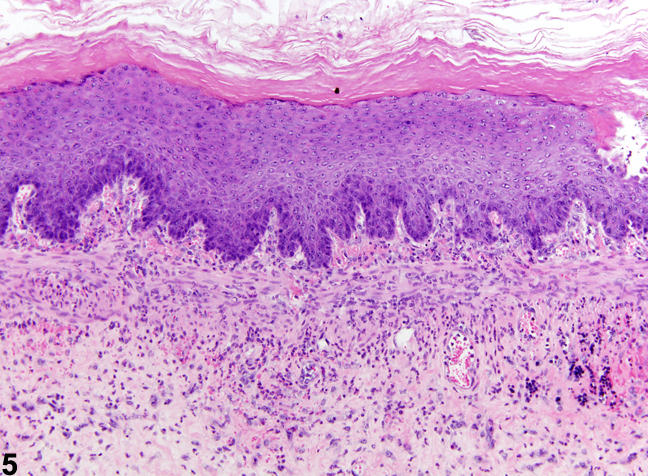 In the tissue surrounding the exudate, there may be fibroblasts, fibrous connective tissue, and mixed inflammatory cells, depending on the chronicity of the lesion. Lymphocytes predominate in chronic inflammation ( Figure 2 ). Lymphocytes also predominate in chronic active inflammation ( Figure 3 and Figure 4 ), but there are also a significant number of neutrophils. 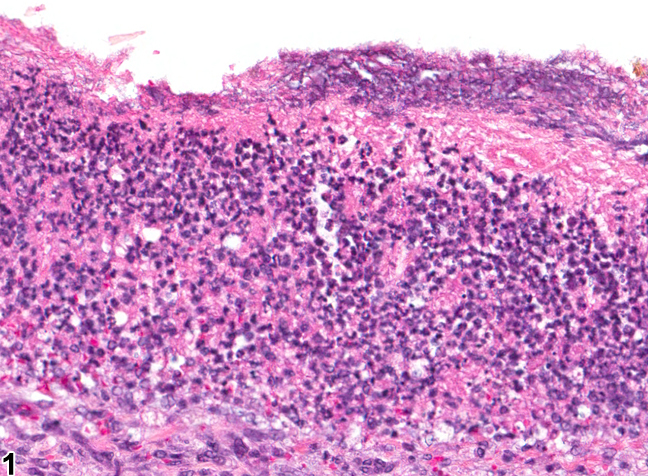 Both lesions may contain macrophages. Granulomatous inflammation is another form of chronic inflammation, but this diagnosis requires the presence of a significant number of aggregated, large, activated macrophages, epithelioid macrophages, or multinucleated giant cells. Inflammation should be diagnosed and given a severity grade and a modifier that indicates the duration or type of inflammation (i.e., acute, suppurative, chronic, chronic active, or granulomatous). The severity grade depends on the extent of area of forestomach affected and the density of the cellular infiltrate. Lesions consistent with an abscess are diagnosed as suppurative inflammation. 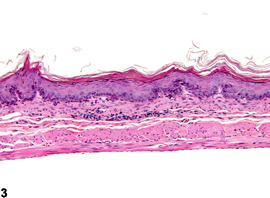 Inflammation in areas of hyperplasia, erosion, or ulcer is not generally recorded unless the severity of the inflammation warrants a separate diagnosis.